For waterfowl hunters, there’s nothing quite like owning your own private hunting oasis. 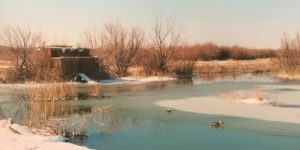 But what makes a good waterfowl hunting property? It is crucial for buyers to understand what criteria makes for the most value when considering the purchase of a private recreational property. Indian Hills Farm is one of those unique properties that represents the perfect combination of criteria that culminate to a waterfowl hunter’s fantasy. Below, we break down the four main elements that make Indian Hills Farm the exemplary duck and goose hunting property. Obviously waterfowl need water. But when you break it down not any old water feature is ideal. Having enough water and a diversity of water features is something buyers should look for in a good property. For example, Indian Hills Farm has close to a mile of meandering frontage on the Arkansas River. In the coldest months of the season while most ponds and sloughs are frozen, the river stays open and offers ducks a welcome place to land. It is also important to have protected areas that give birds a place to roost. Indian Hills Farm has developed two small ponds that attract ducks looking for refuge. These spots keep ducks coming back and are great places for permanent blinds to be set up. 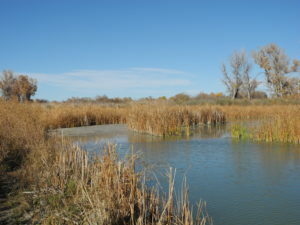 Primary waterways serve as flyway corridors for ducks and geese as they travel from roosting and loafing sites to feeding areas. Major streams and watersheds are an important element to examine when analyzing a hunting property. The Arkansas River is a big corridor to migrating ducks and geese, which puts Indian Hills Farm in great position. Also, it is key to look at what surrounds a potential hunting property. Are there large reservoirs, wildlife refuges, or other environmental features in the area that draw large numbers of birds in? Just to the north of Indian Hills Farm is a significant wetland area created by the river that is a favorite feeding spot for ducks. The property also falls right in-between two large reservoirs – Pueblo Reservoir to the west, and Lake Meredith Reservoir to the east. This is why birds fly. Having a food source on or near a potential property is of paramount importance when considering the value for waterfowl. Using Indian Hills Farm as an example again we can illustrate the ideal situation for buyers on the search for the “right place”. Indian Hills Farm is found within a larger region of agricultural production. Everything from grain, to alfalfa, to corn is grown in the area surrounding the property. Natural aquatic plants are also plentiful within the stretches of the river and wetland areas. Furthermore, Indian Hills Farm has approximately 40 acres in available crop fields within its boundaries. 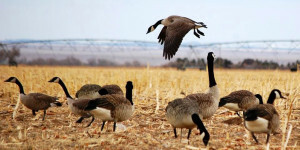 With these kinds of resources, a waterfowl property owner can strategically develop and position food plots that will entice ducks and geese in a big way. 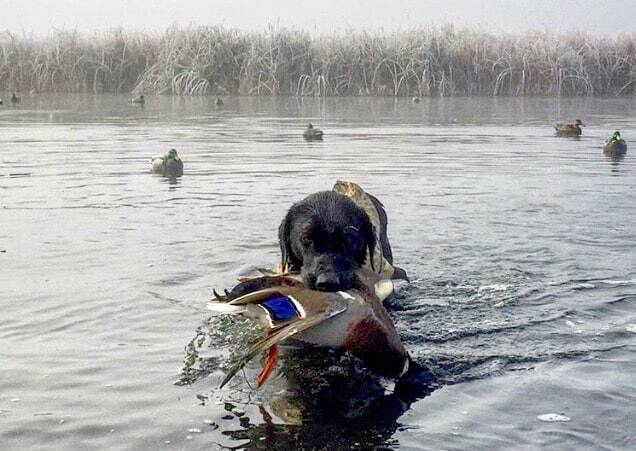 Waterfowl prefer a certain type of habitat. There must be natural cover available and depending upon the region where a property of interest is located, there are a few main types of vegetation to look out for. 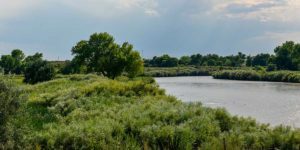 A riparian area, or riverine ecosystem like the one the Arkansas River creates on Indian Hills Farm, produces natural vegetation like cattails, cottonwood trees, willow scrub, and various grasses. These kinds of plants are an indicator of a healthy ecosystem where waterfowl can thrive and will return to over and over again. There are several other habitat types to be aware of when searching for a waterfowl property throughout the US. The primary ones are freshwater wetlands, lakes and ponds, pothole prairie grasslands, and coastal or tidewater marshes.